The fiber from apples helps to remove nausea-inducing chemicals from the body. But having too much of it at a time can also worsen things. Take small bites of apple through the day. Try apple juice if you are having trouble digesting the food. High-starch products like crackers, toasts, and bread help to absorb stomach acids and calm a sick stomach. Pregnant women can keep a handful of crackers by their bedside and eat a few before getting out of bed in the morning. Ginger is known to reduce nausea and vomiting. Try a cup of ginger tea or ginger ale, or a small piece of ginger candy to relieve nausea. Take small sips of plain water when nausea strikes. Water will not only keep you hydrated, it will also prevent the headaches that often accompany nausea. Start slowly by drinking small amounts and increase your intake gradually. Protein deficiency can make your nausea worse. 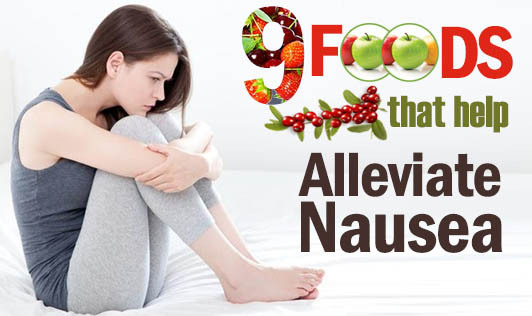 If nausea strikes, try eating some protein-rich, easy-to-digest foods such as nuts. They will quickly replenish your depleted energy and keep nausea at bay. Warm and clear, low-fat chicken soup will not only make you feel better when you have cold, but also help you get rid of nausea. These drinks contain electrolytes to help you restore depleted minerals and make you feel better when you experience nausea or vomiting. If your nausea is accompanied by vomiting and dehydration, snack on a banana. Not only does the fruit give you energy, it also helps you restore lost potassium. Thought the aroma of mint alone is enough to make you feel better, chewing or drinking mint tea can also prove effective in relieving nausea.